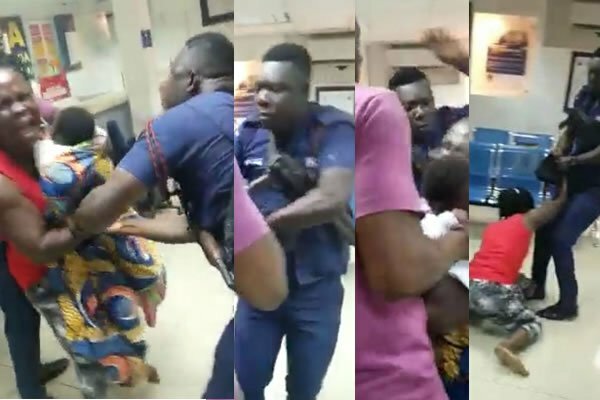 Majority of Ghanaian social media users are furious after a police officer was seen assaulting a lactating mother in a video which is going viral. They have called on the Police administration to deal with this heartless officer. The police officer is seen holding onto the woman and hitting her multiple times with an umbrella, as she tries to wrestle away. The baby was eventually rescued by some bystanders from the incident as the officer drags the woman to the floor. According to Myjoyonline.com, the woman, who is yet to be identified, had gone to the Midland Savings and Loans to withdraw an amount of money. She, however, reported a little late after banking hours and was asked to leave. The woman who was clutching to her baby is reported to have pleaded with the bank officials to allow her cash her money. For daring to appeal, Frederick Amanor Skalla, was asked to send her out of the banking hall and he did that in Rambo-style. Starting with an umbrella, the policeman hit the woman and her baby several times in the head before he started slapping and punching her.